In January 2011, the oldest post-World War II baby boomers began turning 65; since then, roughly 10,000 boomers have celebrated their 65th birthday every day. By the time the last of this generation approaches retirement age in 2029, 18 percent of the U.S. will be at least that age, the Pew Research Center projects. The Centers for Medicare and Medicaid Services estimates there will be 81 million beneficiaries in 2030. For sure, many of those Americans will resist retirement if possible for both economic and lifestyle reasons. But the explosive volume of Americans qualifying for benefits will put extraordinary pressure on government spending for Social Security and Medicare – two of the premier federal entitlement programs that are gradually running short of cash. Budget experts say that significant growth in spending on retirement benefits and health care for the elderly are the major drivers of the national debt, along with moderating growth in tax revenue and rising government interest costs. 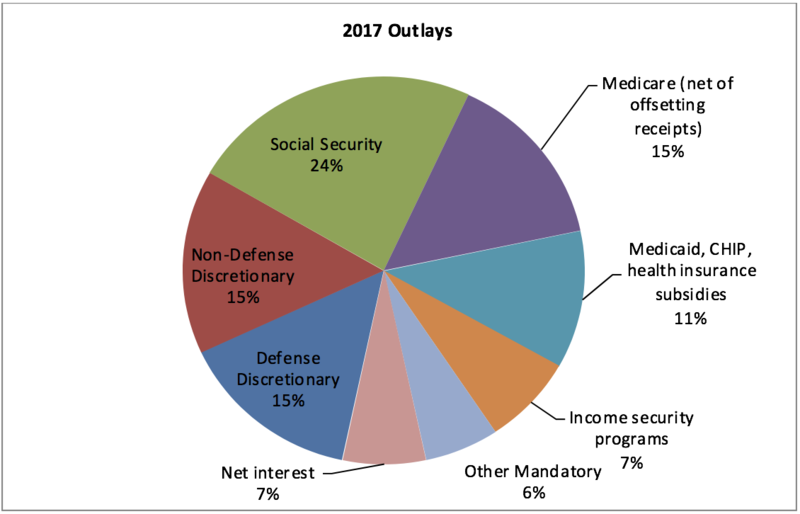 About 24 percent of the $3.95 trillion of federal spending last year went for Social Security programs and 15 percent for Medicare for older Americans. As baby boomers make increased demands on the system, entitlement trust funds will begin to run out of money, putting added pressure on the debt. At the current rate, the Social Security Disability Insurance Trust Fund will be depleted in 2033, with just enough money to cover 89 percent of benefits, according to the trustees’ report. The Medicare Hospital Insurance Trust Fund, meanwhile, will begin to lose altitude beginning in 2028, with just enough money available to cover 87 percent of benefits requested. Unless Congress and the administration eventually take action to address a situation in which fewer and fewer active workers are paying taxes into the retirement system for a burgeoning number of retirees, the Social Security Old-Age and Survivors Insurance Trust Fund will be depleted in 2035 – with only enough to provide 77 percent of retirement benefits owed. That will also be the year when – absent dramatic congressional and White House intervention --the publicly held debt will surpass the historical high of 106 percent of Gross Domestic Product.